First, Type in Your Name or Text in Text Box Templates to the right of each wrestling phone case under “Edit this design template”. To Change the blue background and the light gray text color, Click the “Customize it” Button. Then Click the tiny eye dropper tool under “Printed Background Colors” to see lots of color choices or click the “Advanced” button to use the cool color slider or to type in your Color HEX Code. Whether wrestling in the UK or the USA, these unique wrestling theme gifts are available! 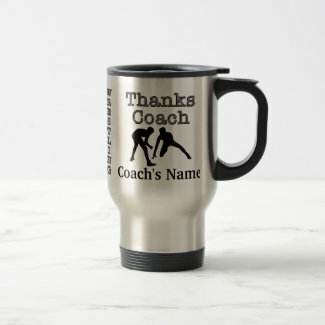 Find great ideas for wrestling coach gifts, team player awards, even gifts for wrestling fans! Personalize these actual wrestlers on this awesome UV resistant and waterproof metal key chain by changing the text “You’re Awesome” to Coach’s name or perhaps the year or team initials or omit this text. You may change the background color to colors or color of choice. Two size options. 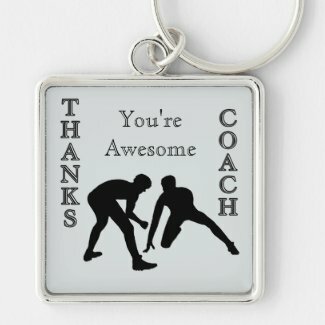 Tell Coach Thanks! with this Terrific Travel Mug with His Name on it! Customize with your Coach’s Name and Year, and you can add background color on this spill-proof stainless steel commuter mug. 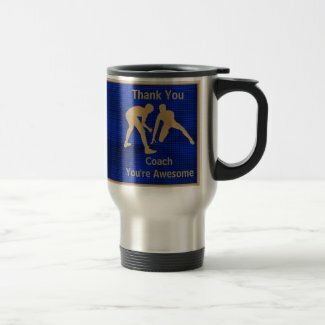 Click above for more mug types that even includes a ceramic mug, stats, and instructions on how to customize this great gift for your favorite wrestling coach! Customize this Accent Pillow with your TEXT, adding your School Name or Year or other TEXT. Background color can be easily changed to match room decor. With a hidden zipper, these 16″ x 16″ polyester pillows are wrinkle free and made from high quality Simplex Knit fabric, for great color and definition to text and design. This cool pillow is made in the USA and is machine washable! Great accent and great wrestling gifts! 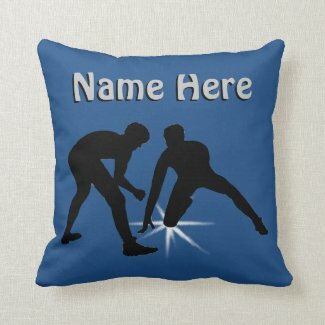 Personalized Gifts for a Wrestler! 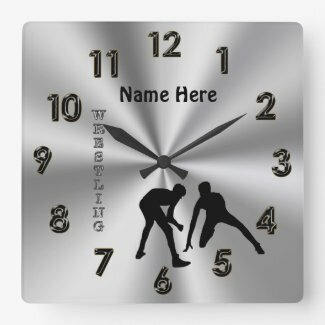 Personalize this sharp-looking wall clock with your Wrestler’s Name. Two sizes to choose from. Will be a great addition to a bedroom wall or Coach’s office! 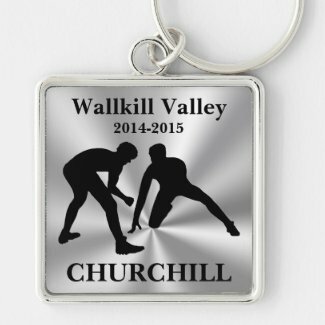 Great wrestling team gift ideas that can be customized with the Year and School Name, even changing the background color. Makes great high school wrestling awards! These buttons are scratch resistant Mylar, comes in 5 different round sizes ~ square is also an option! These would make great keepsake wrestling gifts! Even the silhouette of the wrestlers can be changed to a different color too. No minimum number to order, ordering only one, as low as $2.20 is a great bargain, to create a one-of-a-kind special keepsake! Great discounts for bulk orders which have the same text! Be sure to include a personalized gift in celebrating a victory since there are no minimum orders! Call Linda or Bev for any help with your custom design or ordering, 239-949-9090. The Sweetest Personalized Wrestling Gifts for Coaches and Wrestlers, hands down! And you can’t beat a keepsake that’s practical, too! Jelly Belly glass jar comes with mints or Jelly Belly™ flavors. Click above to see the flavors, including buttered popcorn, cotton candy, bubble gum, coconut, very cherry, and many more! Candy is gluten and soy free. Personalized with 3 text boxes, for a year, name or name of school, rankings or whatever text you choose. “Thanks Coach” would be sweet here, too! Great keepsake keychain ~ As show here, with name of school and year, and last name. A great choice for an inexpensive wrestling gift for that one special team member or for a whole team, great for end of season awards! Group discounts apply for orders with same text! The keychain is waterproof and full color. Customize with a Year and two text boxes for Team Name and/or School Name. The background color can be easily changed. Comes in different styles, sizes, plus square ~ prices as low as $2.25, up to $19.95. 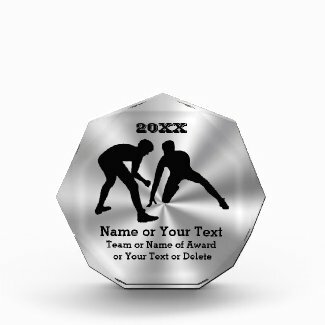 3 Sizes Available for the very cool Octagon Wrestling Award for Coaches and Wrestlers. Type in your text or Call Linda to create another wrestling coach award or an award for Championship Wrestling and fantastic Senior Night Wrestling Gifts for Wrestlers amazing memory. 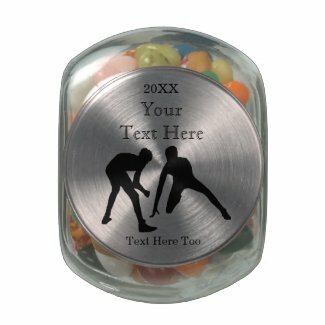 These wrestling gifts can be ordered in Jelly Bean shape! Very cool! Another great inexpensive gift idea for end of year gifts for even a whole high school wresting team ~ check out the quantity discounts! This sweet gift of recognition for a job well done comes with fresh mints or a random mixture of great popular flavors ~ Click above to see the fantastic selection! Candy is gluten and soy free and kosher certified. This tin can be customized with Your TEXT, such as Name or Name of your School, and Year, even saying Congratulations! Background color can easily be customized. Prices vary per size. Easily customized or Call Linda and she will be glad to help with the changes on any Zazzle product. Team Stickers! Great Wrestling Team Gifts! Other great wrestling gifts! Show off your wrestler’s year with Name, Team Name, School Name, or any other TEXT with this original silhouette of wrestlers backing you up! Even the background color can be customized to an endless palette of colors! Comes in two sizes, the stickers are scratch resistant front, and no minimum order! Sheets of 6 or 20. Check quantity discounts for orders with the same text. Call Bev or Linda if you need help in any of the personalizing, 239-949-9090. What a story! Nick Suriano! is a Super Star! Going for his third New Jersey State Championship in as many years, and only a Junior, Nick has drawn the attention of not only the wrestling world, but those who love to hear of hard work, determination, a desire to win, the guts to train hard, and the love of the sport. To Top it Off, it’s all combined into one 120-pound package with an astounding high school record of 117 to ZIP! And ZIP Nick does, sliding them off the mat as fast as they walk onto it, without any offensive points against him since 2012. Who in New Jersey is going to beat him? Since he is ranked number 2 nationally, our bet is no one! Read more about Nick Suriano, a name sure to become a National Superstar and Hero! With his great determination and self motivation, he’s a hero we’ve been waiting for! Go Nick! Thanks to Matthew Stanmyre with NJ Advance Media for NJ.como for this great story about Nick!